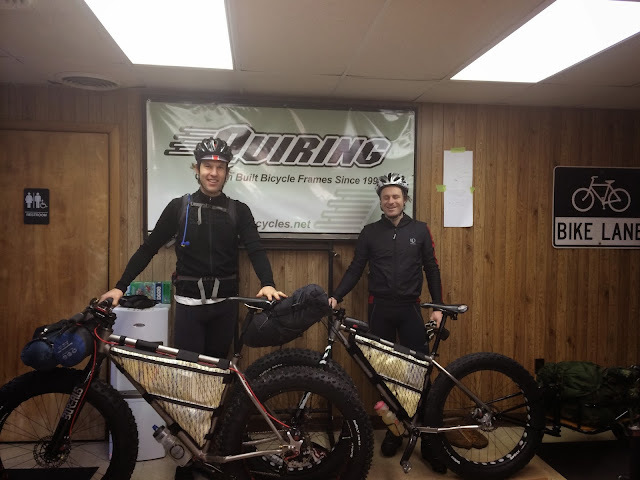 Scotty Q and I had been talking about going on a bike packing trip for months now but something was always getting in the way of a trip actually happening. After too much talk and too little action, we knew the window of opportunity was closing as gun season and winter near. The weekend after Iceman was the perfect opportunity so we started watching the weather forecast and plotting out different possible routes.There were three primary north/south options we were looking at using: 1) the beach, 2) North Country Trail, and 3) The Michigan Cross-Country Cycle Trail which is a motorcycle trail that is billed as “The Longest Continuous Marked Motorcycle Trail on Earth”. It was just a question of what areas we wanted to check out and when our best weather would be. We had a three day window in which to do a two day trip and a couple days out it looked like Saturday there would be rain and Sunday/Monday would be colder with and a consistent north wind. Since we wanted to do a loop to the south, Sunday and Monday looked like the perfect days for the trip. We could get blown south on the beach by the fat north wind and then ride back north in the protection of the woods! Sunday as the sun dawned and Scott and I took off from Quiring Cycles World Headquarters going west to the shoreline. We got to the beach and the waves were HUGE. 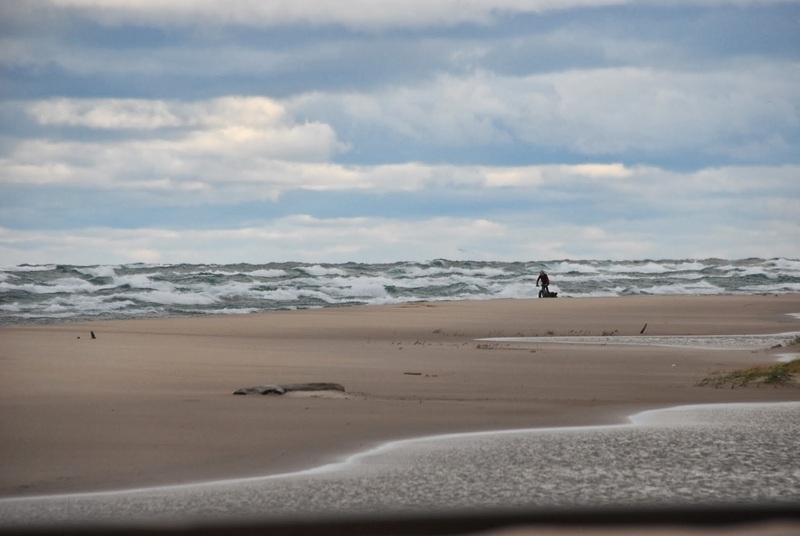 Looking out to the first and second sand bars you would see 15+’ waves breaking. As is typical for November, it had been blowing nonstop for about a week straight, so there had been a lot of sand blown around. All the freshly blown sections were like riding through pudding and the established sections were nice and firm. All too often on this stretch you would hit a pudding section and your bike would come to a dead stop right at the same time that a big wave would come rolling in and just nail you, dousing you from the knees down. This made for some hard going but it was gorgeous riding and as long as you kept rolling it never got too cold. We eventually made it to Big Sable Point and the lighthouse which was a welcome sight because south of the point the waves coming up on the beach would be smaller, decreasing the number of times that we would be getting hosed. We had a very pleasant ride through the Ludington State Park and then down the coast to Ludington where we were able to stop, get some coffee and dry out our socks and shoes. Q and I definitely added to the ambiance of the coffee shop! 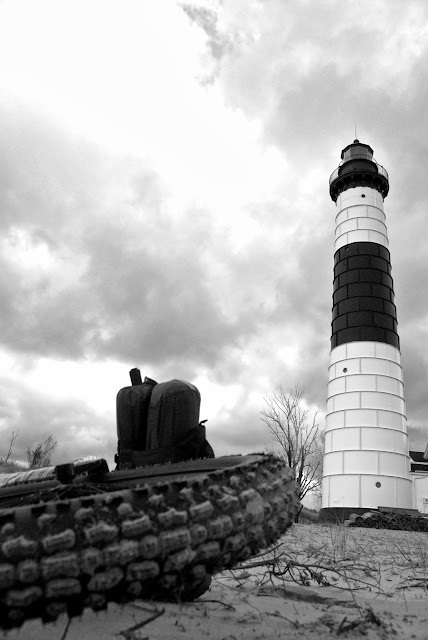 From there we had to ride the roads around the Pere Marquette River and then past the huge Consumers Power reservoir. After that we were able to hit the beach again at Summit Township Park. 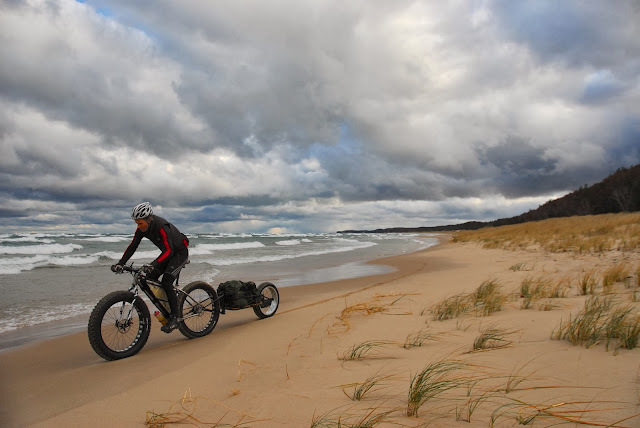 We were treated to more blissful downwind beach riding all the way to Pentwater. 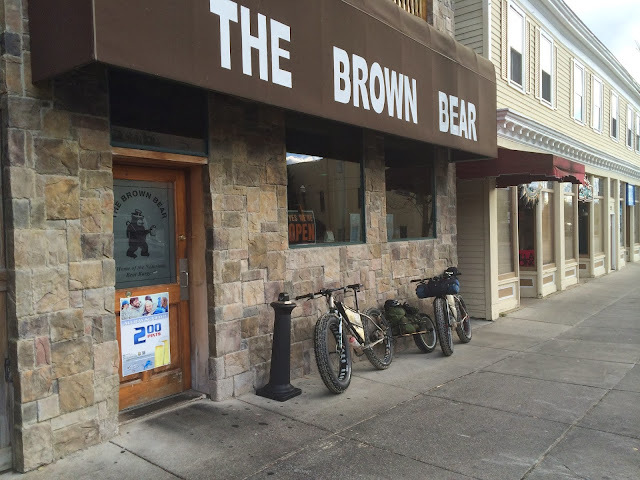 By this time our thirst and hunger were really kicking in so we swung into town and stopped at the Brown Bear for food and a glass or two of their signature Belgian style beer. Feeling refreshed and fueled up we headed east. Paved roads quickly gave way to gravel as we entered the National Forest again and eventually we were on forest service two tracks again. We then hit the Crystal Valley ski trail and climbed up to the top of one of the big hills in the area and made camp. Q went all Eagle Scout on the fire and we had a merry and relaxed time relaxing and sipping by the fire before going to bed in anticipation of a long day on Monday. We woke to rain and temps in the high 30’s but the radar/forecast was showing that the rain would stop around 10 in the morning. 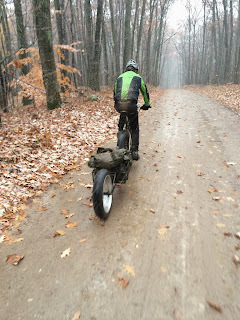 We took our time getting rolling and hit the trail about 9 in light drizzle. The forest service roads in this area are awesome with long gradual climbs and descents through the forest with occasional openings. 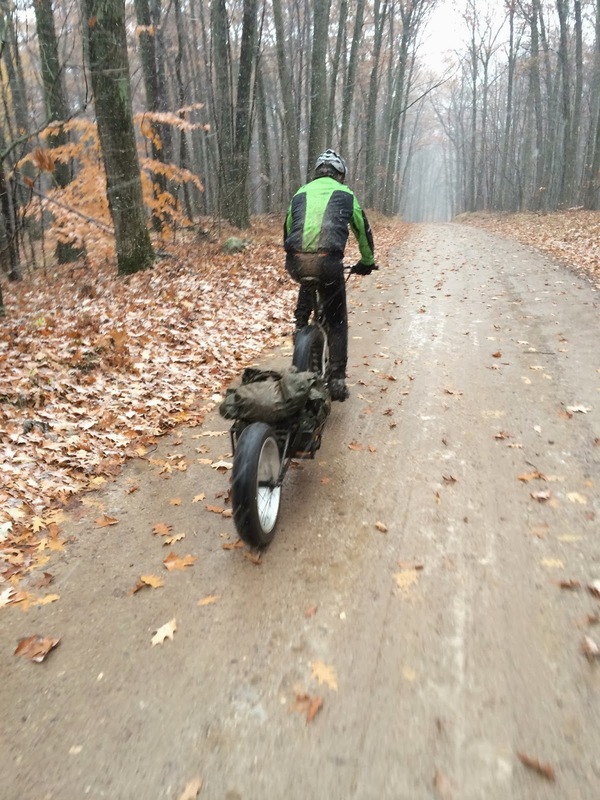 Unfortunately the drizzle turned back into rain but we were moving along well and were protected in the woods. Around 10am the rain did stop. The bummer part was that the precipitation didn’t stop, it just turned to snow and the temps dipped below freezing. 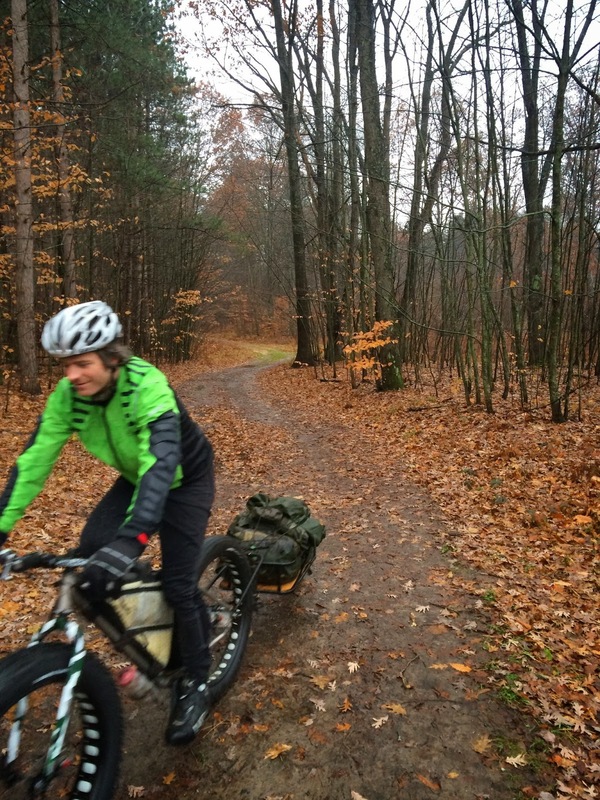 We also started to hit some gravel roads which were peanut butter consistency from the rain we had gotten. After about 3 hours of riding we had made it to M10 (a “major” two lane east/west road) and things were starting to get a bit grim. We were pretty well soaked, the cold was starting to set in and we were almost out of water because we had skipped filling up on water at the river so we could keep riding and generating heat. 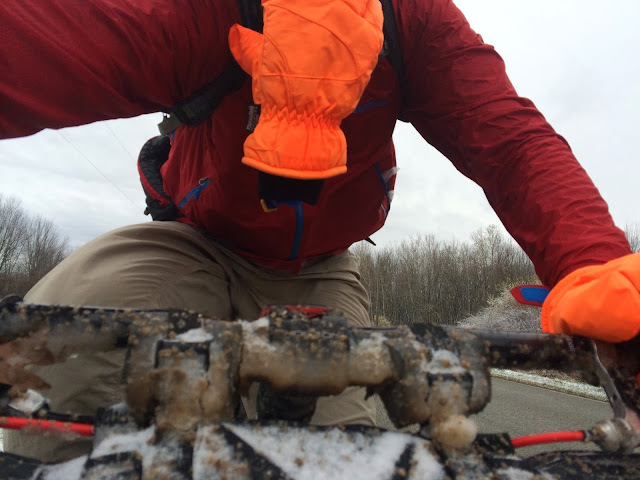 We had two options: 1) Keep on the planned course and head northeast on trails with no good bailout options, no shelter and no good resupply options for the next 2-3 hours of riding, or 2) take M10 back towards civilization with many options to stop at stores to warm up, dry out and snag some food/drink. It didn’t take much discussion and we hit the road towards civilization. 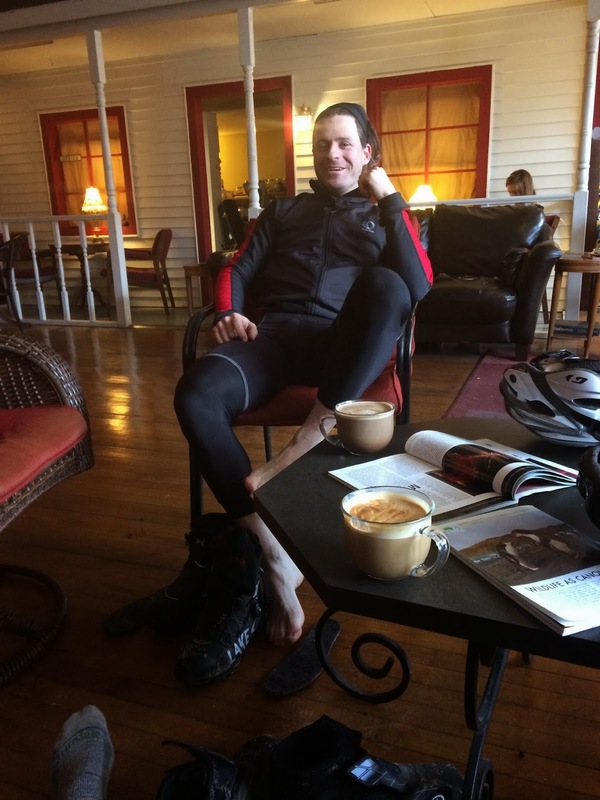 After another hour of riding we rolled into Custer. 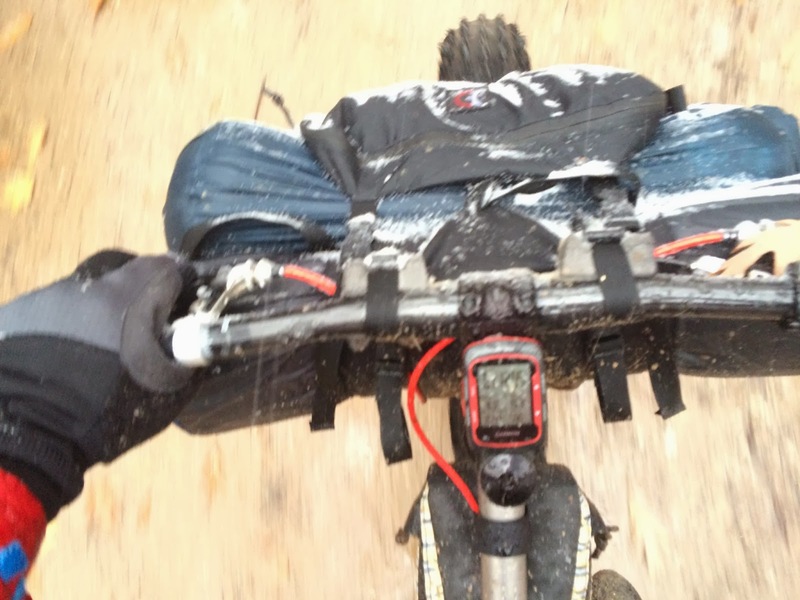 At this point neither of us could shift because our drivetrains were frozen solid. There were not a lot of options but luckily there was an old school hardware store that we could roll into. Come to find out our brakes had frozen too! The owner of the hardware store was awesome and let us warm up by their heater. The selection at the hardware store was limited but we were able to fuel up on rice crispy treats and mountain dew (fuel of champions!). We also bought about a dozen heat packets which were strategically placed on hands and feet. I had the score of the day though and was able to pick up some hunter orange gloves for $8 and discontinue use of the two pairs of gloves I had brought and had soaked through. 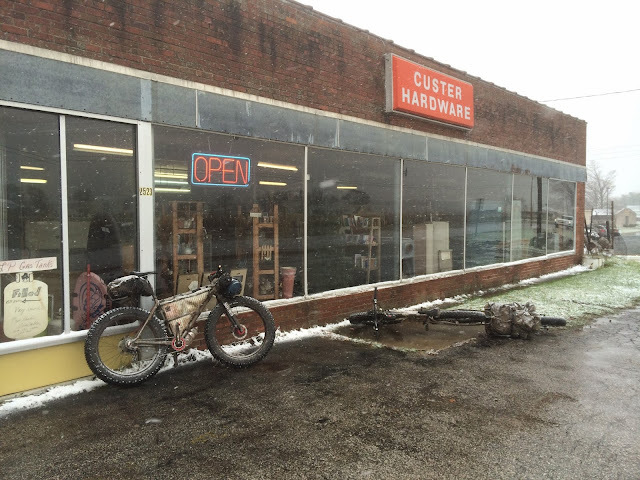 From Custer Hardware we only had 12 miles to go but it was straight into a 25+ mph headwind through exposed farmland. This made for some really hard going and I felt good when I saw double digit speeds on my Garmin. 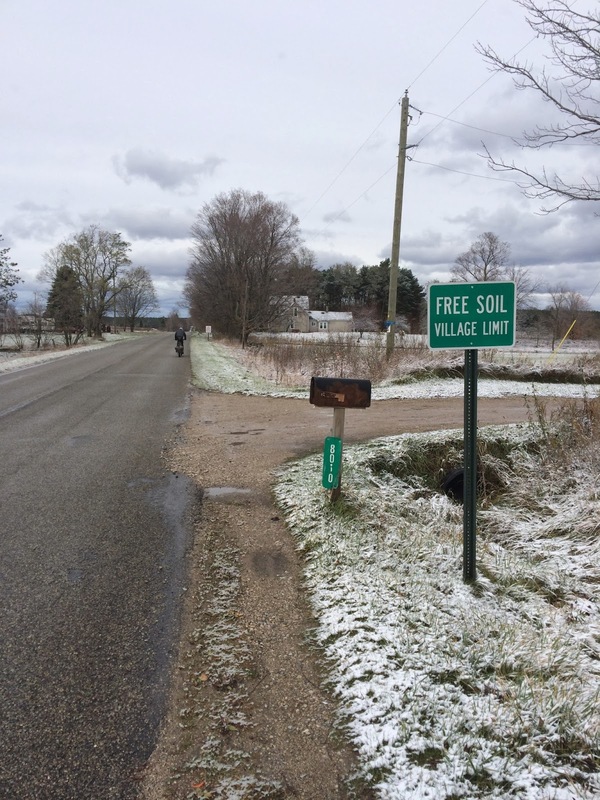 After about an hour of riding we hit the Freesoil village limits. A few more miles later we rolled through farm fields and onto the back of Quiring Cycles World Headquarters property. We were both thoroughly wiped out and ready for some heat. While it was a bummer we didn’t get to take as much trail as we would have like on the second day, we made it back safe and sound and had a lot of great riding in over the two days. More info on the “Fat” trailer please !! Looks sweet ! Nice job guys. “Adventure” all the way… Phenomenal pictures! 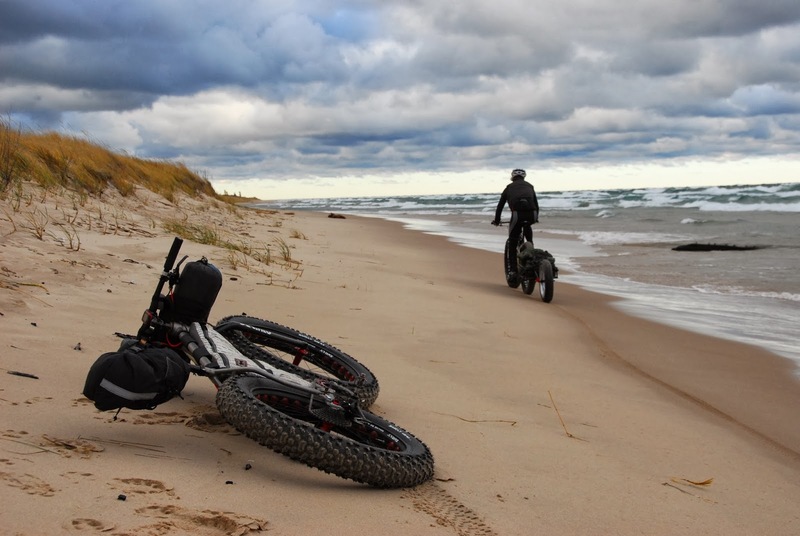 Looks like November is tough on Bikers too… The Edmund Fitzgerald wrecked on Nov 10th, after I saw your pictures of the lake I can see why.